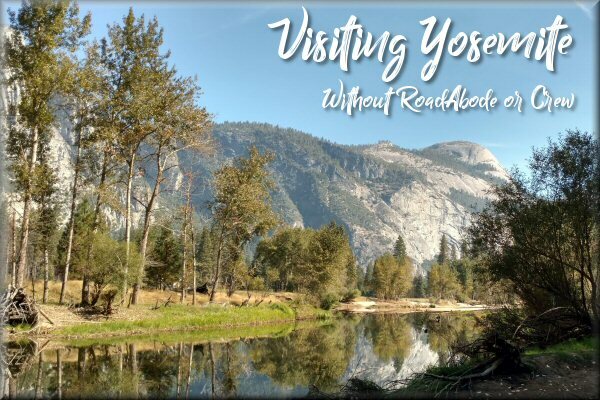 Part 1 is here - where my travels into Yosemite began. 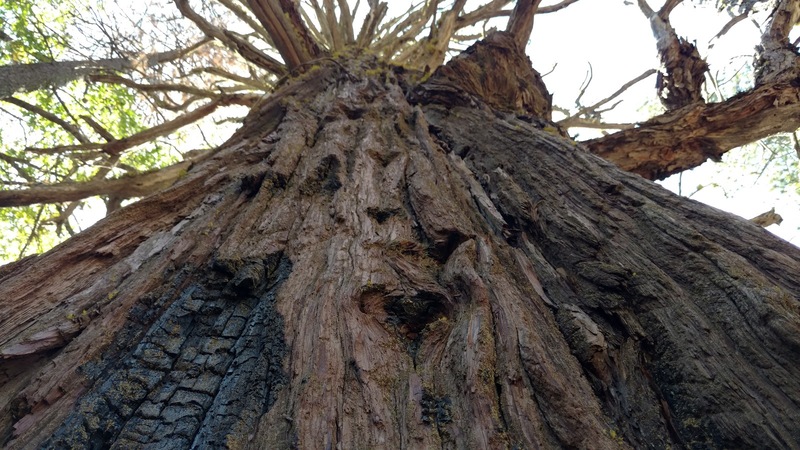 After looking at the fire marked trees in the area I found between Southside Drive and the Merced River. I drove a little further and came upon a sign for a picnic area - with restroom. Seeing an opportunity to have a snack and use the facilities, I took the turnoff onto the gravel road. Only a few people were picnicking, as I drove along the roadway. I parked near where it began to circle back, near the pit toilets. 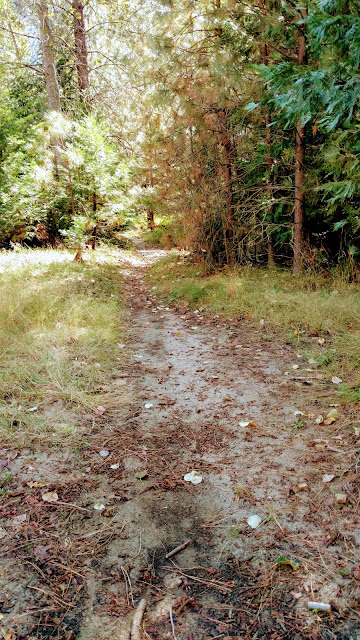 After using the facility, I noticed a slightly overgrown sandy path into the woods, and decided to follow it. The sandy floor gave way to a pine needle covered path, shaded by deciduous and tall pine trees. Soon to my right the trees opened to reveal views of the river and mountains. I jumped down the short embankment to a small beach. with a beautiful view of the river with the mountains right behind. The vistas made me just stop and gaze for quite some time. No one was around. I could hear some light traffic on Northside Drive, but could not see the road. I hopped back up on the path and followed it a bit more along a turn in the river. Here the path leveled off with the river, and I was able to walk onto an open gravel larger beach on the curve of the Merced. After enjoying the views in solitude, I headed onto the trail, and back to the Jeep. After hydrating, I drove back onto Southside Drive. 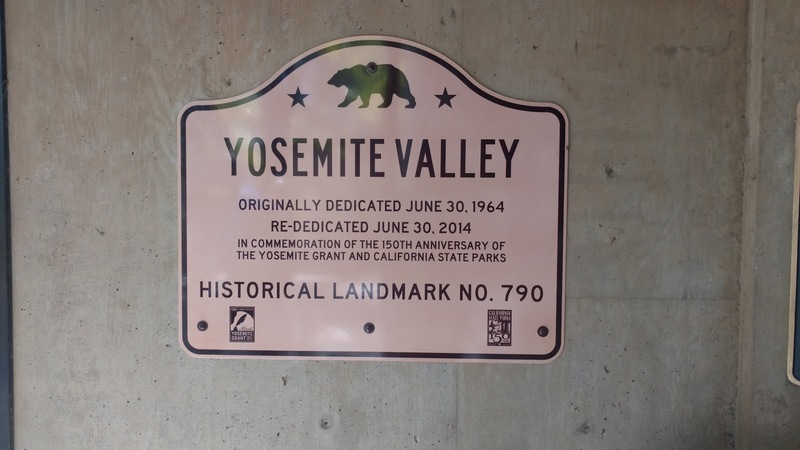 I followed it to signs directing toward Yosemite Village and tried to find parking near the Visitor Center. Due to construction in the lots and on the Northside road, I could not find parking until driving back toward Yosemite Lodge. 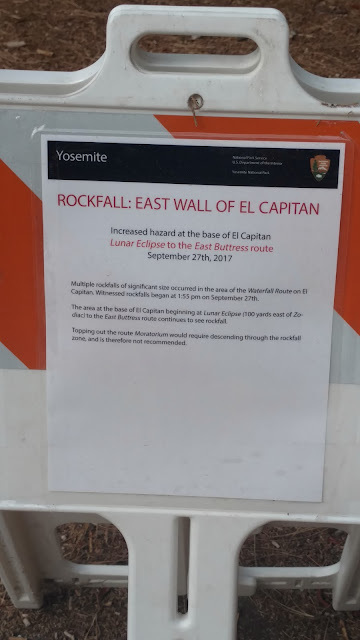 This fortunately put me right across from the trail to Lower Yosemite Falls. 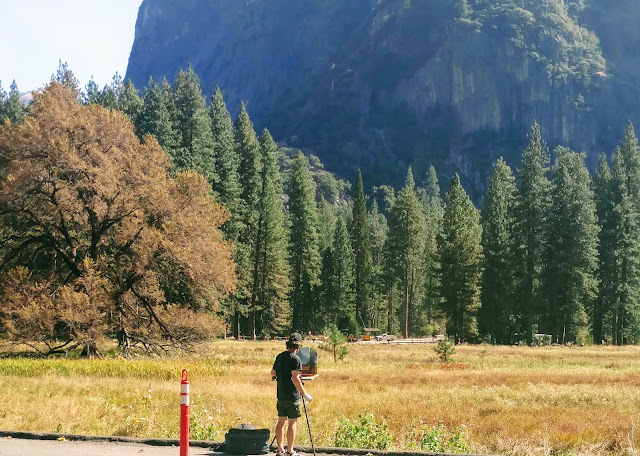 This area, either because of the later hour in the day, or proximity to Yosemite Visitors Center, had the most visitors I had seen on a trail so far. And calling this wide, macadam paved road a "trail" was a bit laughable. It did, however make access to view the Lower Falls easy for all that visited, even those in wheelchairs. 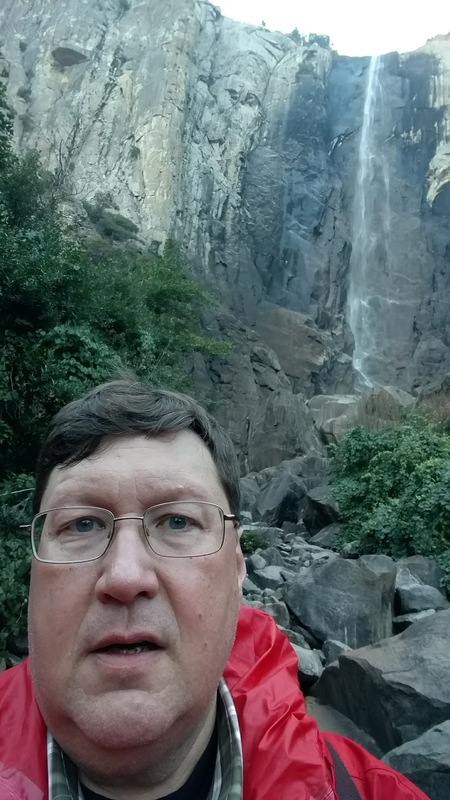 Though I enjoyed the easy walk to the Lower Falls, the amount of tourists caused me not to stay very long. 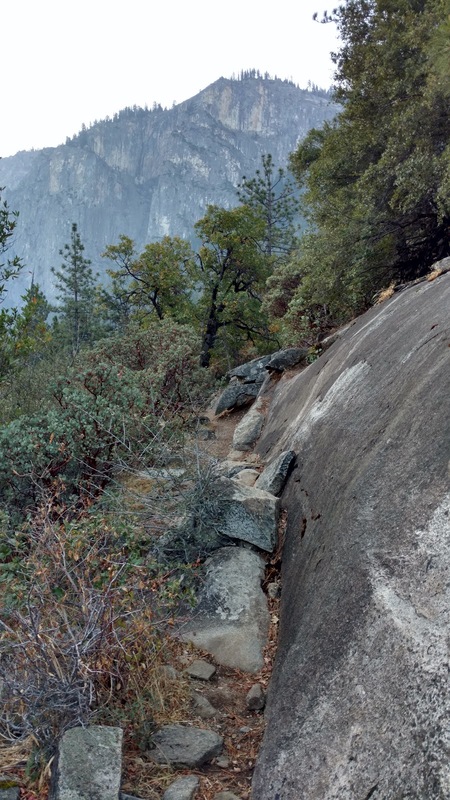 Rather than hike back the way I had come, I headed down a trail that went across the Yosemite Creek, and along the base of Yosemite Point Buttress. 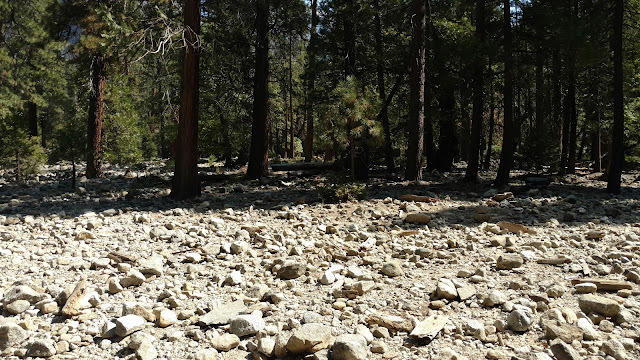 The water level was low in the creek, and the rock riverbed was dry, but still beautiful in its own way. The trail rounded around a massive boulder then turned back down toward Northside Road. Along the way in a small meadow I came across a lone deer grazing close to the trail. It let me get close enough to snap a few photos. Once back to Northside Road, I realized the trail I had taken had left me halfway between the Welcome Center and where I had parked. 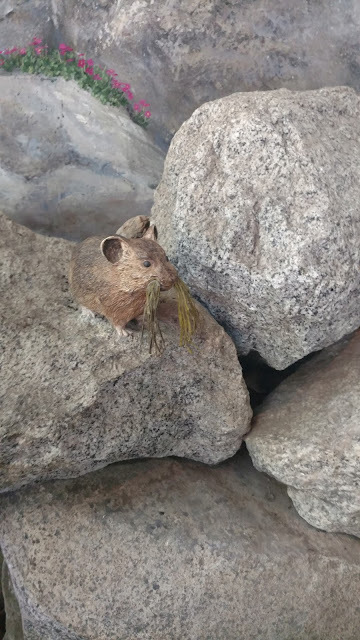 I decided to hike toward the Welcome Center to see what it had to offer. As I walked along I passed a young family. I remember as I passed the young ones hearing the parents discuss how they should have rented bikes to explore further along. It was nice hearing their interaction, and made me think of how great an experience having my own family with me would have been. After I had just passed the youngsters, I stepped on the edge of the macadam path. My ankle twisted, gave way - and down I fell! 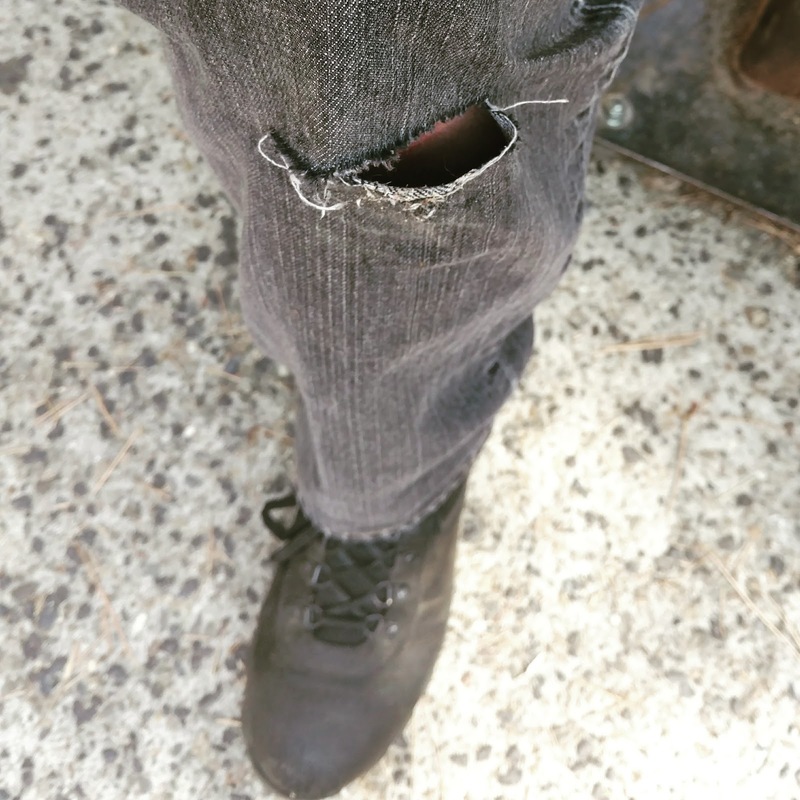 I immediately got to my feet and assessed damage. My weakness has always been my ankles, and I've done this exact thing a few times before. I knew I needed to to keep walking on it (if not broken) so that it would keep loose. The rest of the day exploring depended on my ability to walk well. I continued walking, the ankle and knee hurt, but were staying mobile. 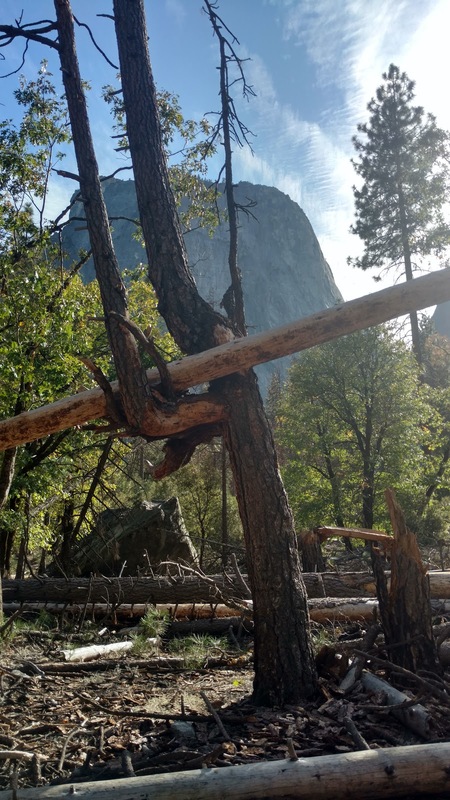 Once at Yosemite Village, I went to a rest room and assessed the damages. The knee was pretty bloodied, and the ankle was sore and stiff, but not painful. Not too swollen either. I also picked some gravel out of my palm that helped break my fall. I sat on a bench, and re-adjusted my boots tighter. Pulling myself together, I was hurting a bit - but I could do this! 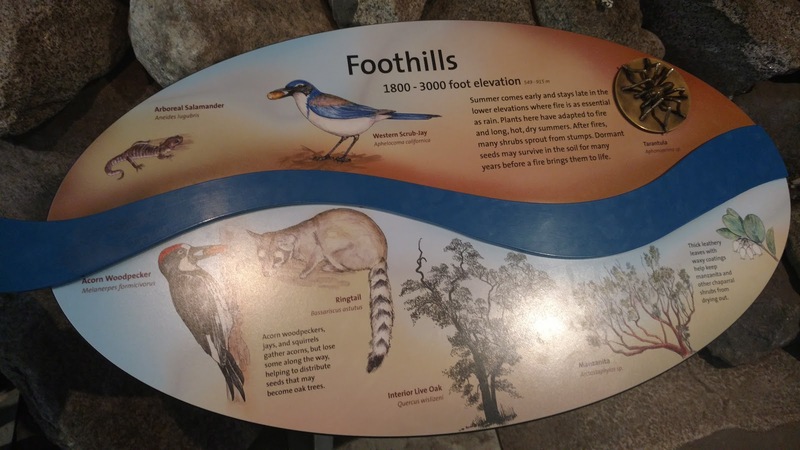 While inside at the Visitor Center, I began getting mad at myself while looking at the animal dioramas, historical, and geological exhibits. I KNEW that my ankles were susceptible to twists like this - since I was a kid. I should have been more careful! I got myself some water, and sat at a bench again and calmed myself down. Beating myself up would only deter my enjoyment of this awesome place. I decided to just take my time, look at the exhibits and museum. I was blessed to be able to what I have done already - and whatever I could still do - I'd make the most of it. Where I first learned about the Ring-tail. Glad I saw one in person! While in the Visitor Center, I also visited the bookstore/gift shop. Only thing I picked up was a Yosemite Patch for our collection. Tee-shirts and tourist trinkets just did not interest me. Behind the Visitor Center, is a "Native American Village" to walk through. 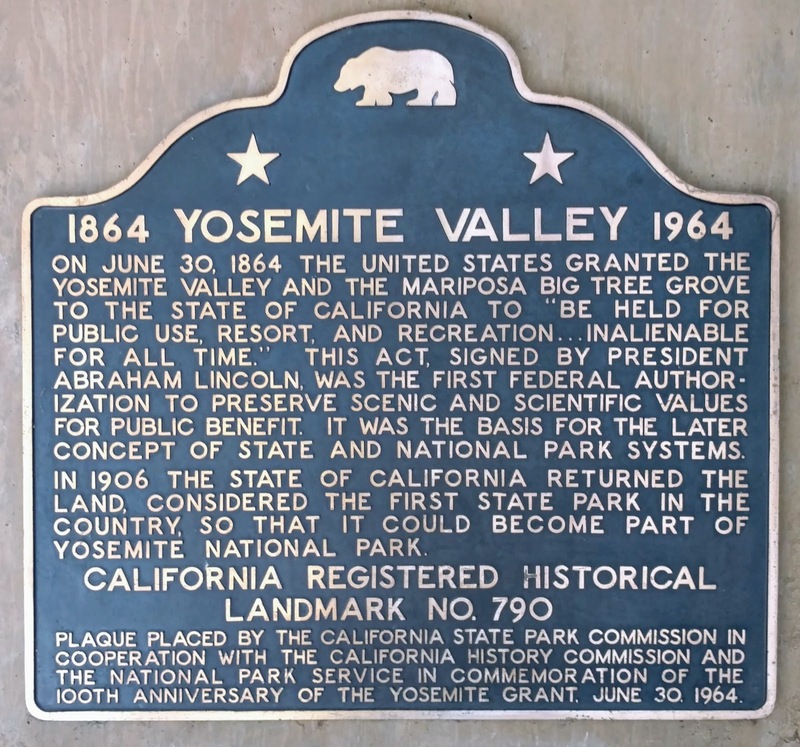 It displayed traditional Bark huts, tools and more of the Tribe that called Yosemite Valley home up to the late 1860s. 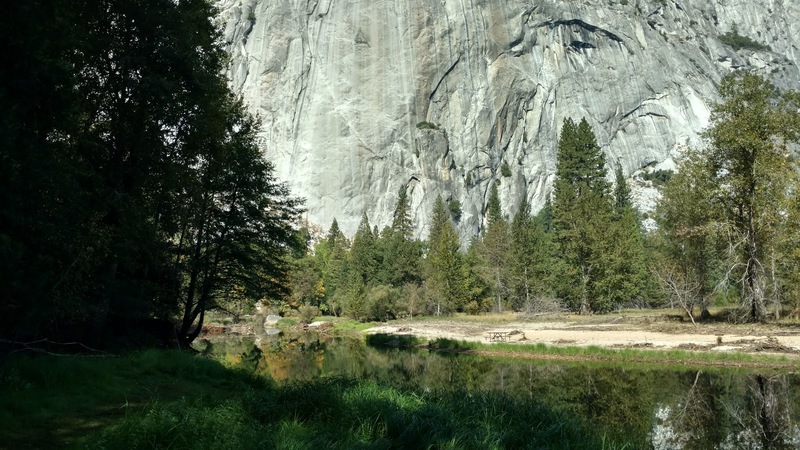 The Miwok Tribe called Yosemite Valley, "Ahwahnee", which is believed to mean, "place of the gaping mouth". 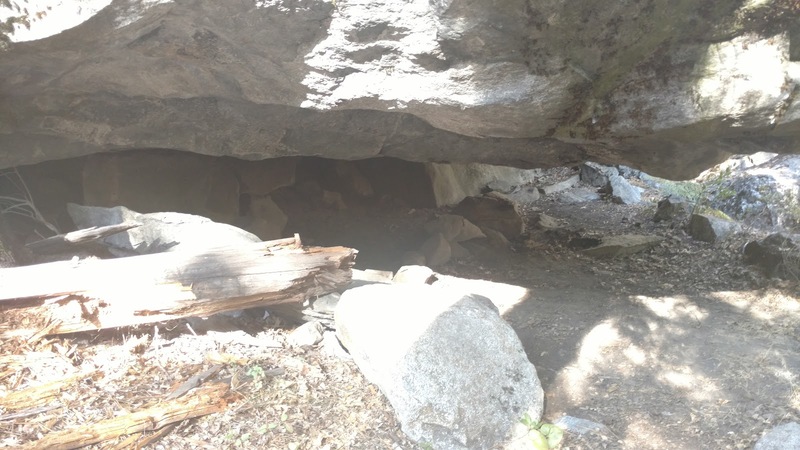 They referred to themselves as the "Ahwahneechee", "dwellers in Ahwahnee". One thing I learned is that Black Oak Acorns were a staple in their diet. At times, the Black Oak Acorn made up to 60% of their food source! Down a path from the Visitors Center is a small museum building, over 80 years old and was the first museum in a National Park. Exhibits included Ahwahee clothing, bead work, and tools. There were also some historical artifacts from when the park first opened. One unusual piece was a 1912 Indian motorcycle, possibly the first to visit the park. 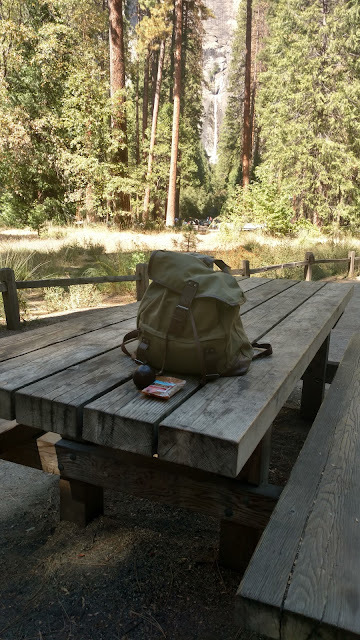 While walking aback to the Jeep at Yosemite Lodge, I decided to stop for a snack at a small rest area with rest rooms. 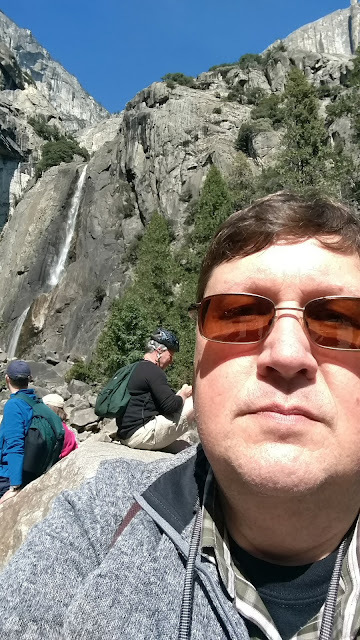 The bonus was a beautiful view to Yosemite Falls. Once back at the Jeep, I planned to explore further down Northside Road, but I made a wrong turn and ended up circling back on to Southside Road. Since I was now heading back toward Yosemite Village, I decided to get a late lunch. First I stopped at the Village Store to see what was available. Plenty of snacks and goods for campers, but I wanted more of a sandwich or burger. The Village Grill was right next door and fit the bill nicely. After enjoying my burger and fries, I headed back onto Northside Road. Construction and traffic slowed things down, but at least the sights were interesting and beautiful. I didn't mind sitting in traffic with these surroundings! The construction appeared to be placement of new curbing and some drainage systems roadside being installed. Traffic and Construction - but with a view! Once past the Yosemite Lodge again, The traffic spread out. I still had plenty of time to explore, and I did not want to leave this breathtaking valley just yet. 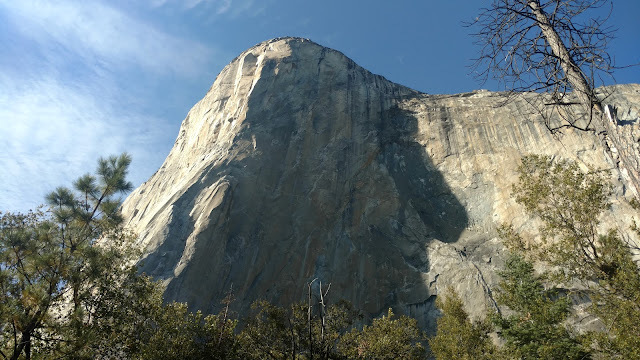 I found a small turn off with lot near the base of El Capitan, and since my ankle was holding up, decided to see if I could hike to it's base. I tried a few trails up, but some of the trails I tried either seemed to end, or became too overgrown to continue. On a side trail - Over hang under a boulder that was big enough for a bear to take shelter - I imagined. There are climbers up there somewhere! As I hiked my ankle was starting to get tired. I could hear climbers of El Capitan shouting to one another, but did not find where they were. I was also not keen to bother them, and didn't want to be the "annoying tourist" invading on their prep or climb time. Also I felt slightly uncomfortable knowing climbers had just been killed by apartment size rock falls only the week before. I headed back down to the main trail to find my way back toward the Jeep. 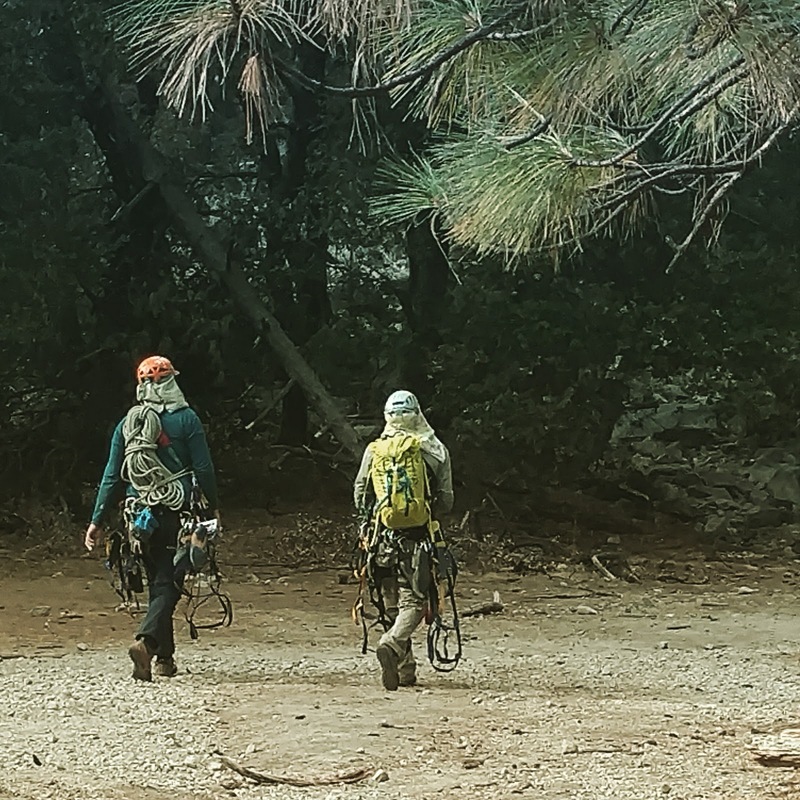 Along the main trail I ran into two climbers just starting the hike toward El Capitan's base - the time was now close to 5pm! They planned to make it half way up the face of the buttress, using headlamps as twillight and night came. They were covered with gear and seemed to be pretty relaxed and confident with what they were about to undertake. 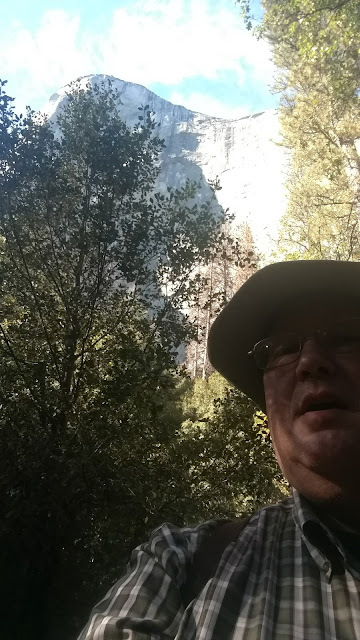 I emerged from the side trail I had last used - trying to get to the base of El Capitan - a little further down the main trail. As I hiked back I came across an area of fallen trees that looked to be cut up to be processed for milling. Some that were still standing were twisted together - and rather interesting. I rested on a log here a bit and drank some water. I tried to keep hydrated as often as possible. 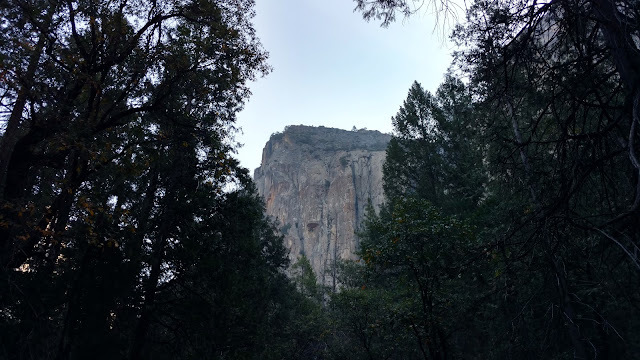 Also in all the park this section (and the side trails nearing the base of El Capitan) were the only ones where I used insect repellent wipes. Small gnats or no-see-ums were buzzing about my head. Once back at the Jeep I realized where I was! I was on the exact opposite side of the large gravel beach I had enjoyed near the Picnic area earlier in the day! And that it seems to be called Cathedral Beach. The long shadows as the day neared it's end were starting to come across the valley floor, so I drove back toward Tunnel View to watch the sun set. This was perhaps not the best choice, but still was enjoyable as I could feel the temperature dropping as the sunlight left the valley and mountains. Quite a few others had the same idea, to capture the waning light in the valley. The Beauty of El Capitan, Half-Dome and more - once again. While resting on the rock wall, I sat back taking in both the scenery and people watching. 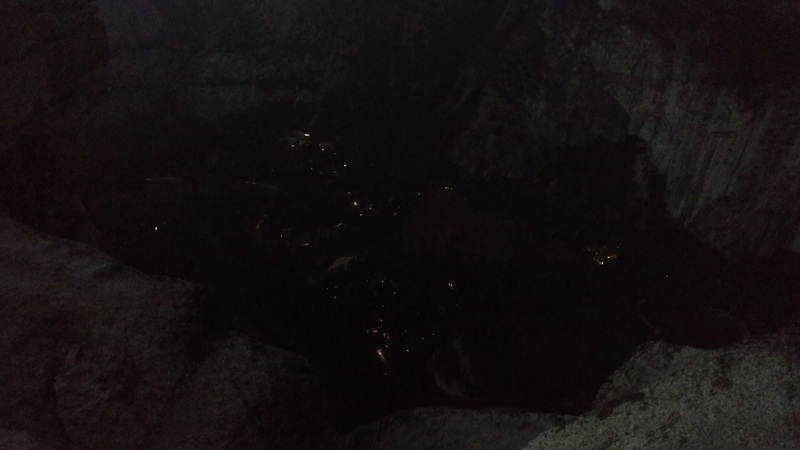 I decided that it was still early, and I wanted to see - if possible - stars from Glacier Point. So I set my navigation and started driving. Elevation is: 4,400 feet at the Tunnel View and 7,200 feet at Glacier Point. quite the climb. 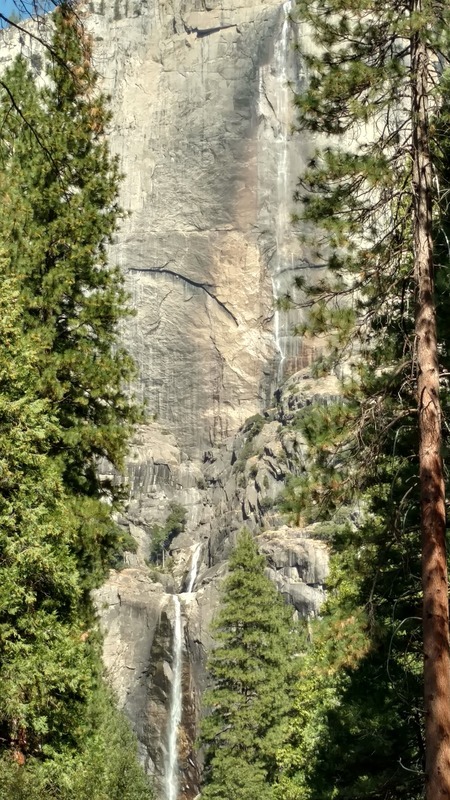 After exiting Tunnel View, the road was mostly downhill to the entrance of Glacier Point Road. I initially passed it, as it is on a curve, and more "driver friendly" coming from the opposite direction. I also encountered barreling around the curve toward me a large semi carrying construction equipment that caught me off guard. Fortunately I only had to drive up to the next pull off, and turn around. 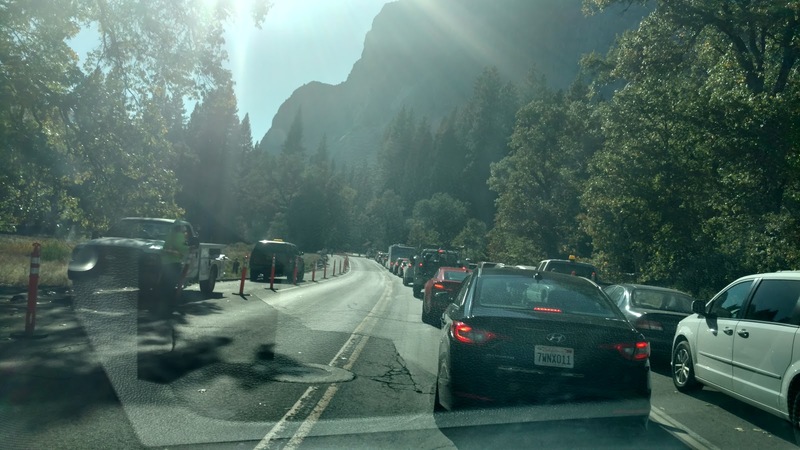 The drive up to Glacier Point is quite curvy, with lots of drop-offs. As I was on a bit of straightaway a coyote was standing upon a hillside near the roadway. I slowed and stopped, but did not even think to grab a photo. He seemed as inquisitive of me as I of him! Further up the road I was greeted by temporary highway signs warning of smoke on the road, and sure enough around the next bend I could smell and feel the slight sting to my eyes of a fire burning on the hills below. 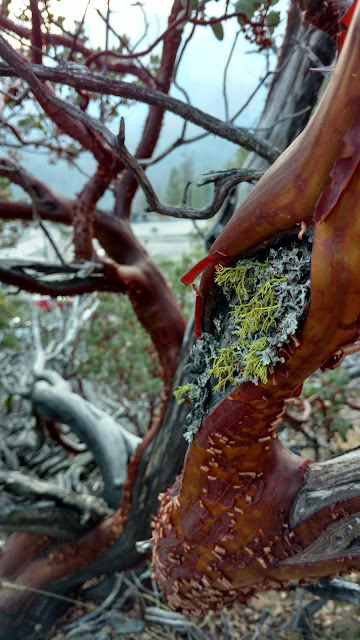 Further along in the dimming sunlight I could see fire scarred trees right along the road. Smoke was in the air, but never impaired visibility to any extent. Once I made it to Glacier Point there were many people coming back to the parking lot from the trails. Apparently I had missed a beautiful "second sunset" - due to the height of the surrounding mountain tops - by only a few minutes. Next time! 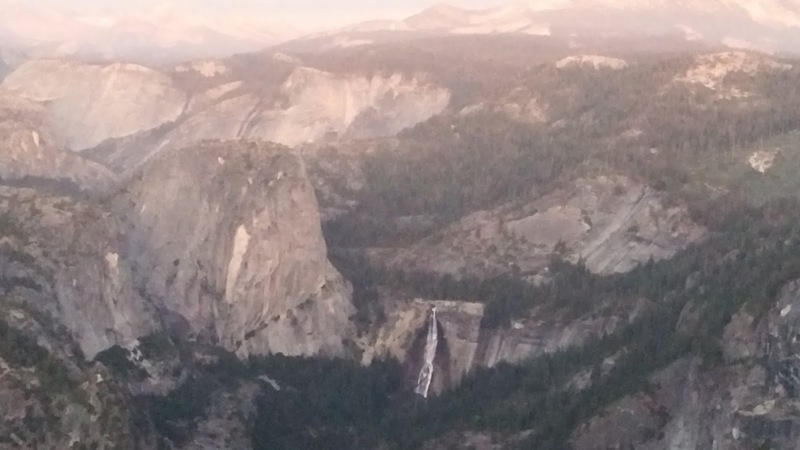 The views in the twilight of Half Dome Village below were beautiful. Lights in the buildings were twinkling on the darkened valley below, and yet up on Glacier Point twilight still let me see everything surrounding me. Twilight did fall fast however, and there were just shadows to guide me back to the car - where I had left my flashlight. I decided to rest a bit in the car, and wait for about thirty minutes till the area was enveloped in total blackness. I was concerned that cloud cover might hamper my view, but these blew by quickly and I was rewarded with a crisp, cold, and stark clear sky, filled with an amazing star field, and a full harvest moon. I found a rock to sit upon, and spent some time just gazing up into the heavens. Looking again across to El Capitan, I could see the occasional twinkle of lights on the almost smooth buttress wall face, and thought of the climbers I had encountered earlier. That could be their headlamps as they still enjoyed the challenges of their planned evening rock climb! Can you see the Yosemite Waterfalls? By about 9pm it was quickly becoming cold, and for my attire, a little uncomfortably so. 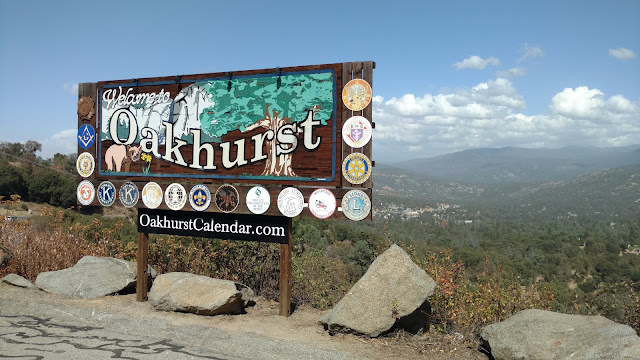 I retreated back to the car and with more than a little melancholy, decided it was time to leave back to my base camp in Oakhurst. As I backtracked down Glacier Point Road, I again saw a coyote. Not sure if the same one, but he was on the opposite side of the wildfire burning below. This time in the darkness I could see actual tree trunks glow with fire, and further down the mountain, a whole hillside flickered and glowed with fire. Smoke hung in the air. The rest of my drive down Glacier Point road, and then back through the National Park gates (again unmanned) was without incident. Before returning to my room in Oakhurst, I picked up some balm for my ankle - to sleep more comfortably - and a ready-made sandwich that I devoured more quickly than I care to admit - apparently spending the day hiking, exploring into the evening, and the Pacific time change made me more hungry than I expected. The knee - scabbed and healed - eventually. The ankle was better than expected coming out of the boot, although I hobbled a bit on it when tired for a week or so. Many things will fade. 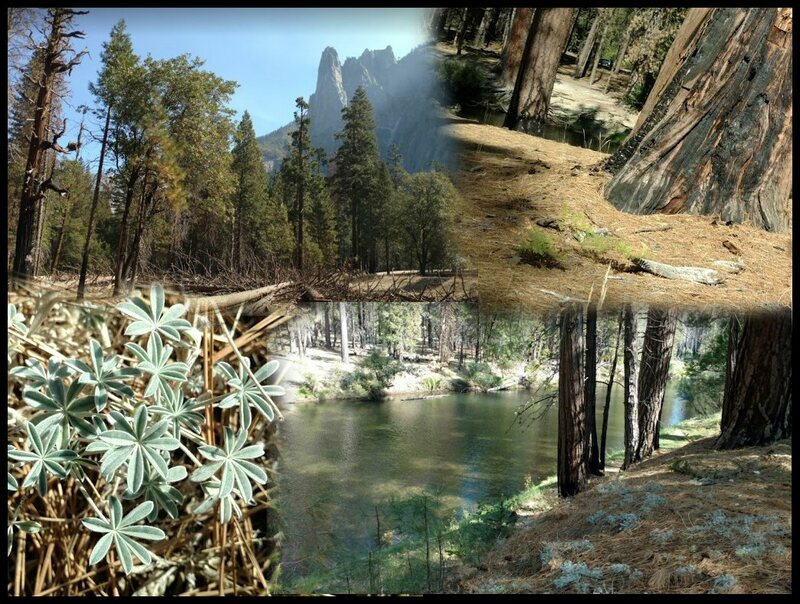 Memories of my one day in Yosemite will be with me, I hope, forever. Thursday - Fly in, assess the site, inventory and verify old & new equipment. Friday - Sometimes organize local temp techs (or do myself) to remove old equipment, put in place new equipment, and work with the team I'm part of to build and bring up the new network. Saturday - Get network tweaked and new desktops configured to company standard with user profiles. Sunday - Work out issues and kinks on desktops, network or phone system. Collect old equipment for recycling and tidy up server room to company standards. Monday - Train local users on new desktop, answer questions, resolve or document issues to be resolved and then fly out. It can get lots more involved, but those are the basics. All while still maintaining my day-to-day tasks. It can mean long days. Mostly I get to see airports, the inside of hotel rooms, office spaces and whatever place we are eating meals. Occasionally though I get to a place where I can take a few hours on a Sunday afternoon to sight see. I usually don't get to plan on where until late Saturday. This Work Trip was different. 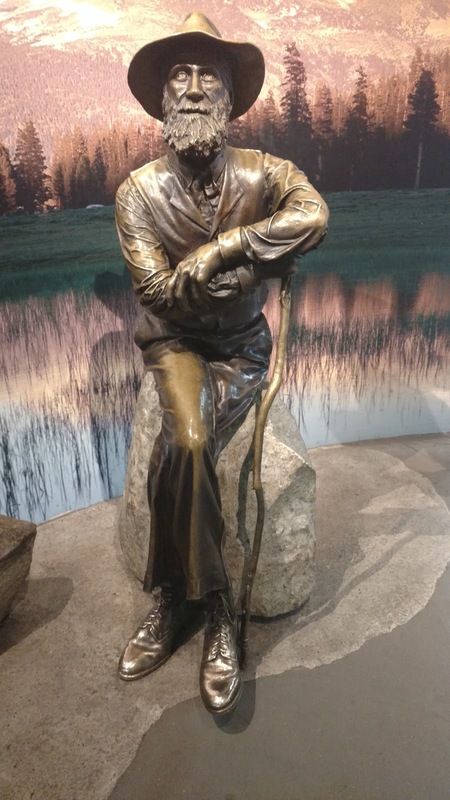 If I planned it right - and weather and wildfire co-operated - I could get a FULL day in one of my Bucket list National Parks. When I saw I was headed to Fresno California, I noticed on the map that the town was near two places on my bucket list - Yosemite Valley and Kings Canyon National Park. Both were approximately two hours away from where I needed to be for work. Over dinner on another trip, I checked with my team lead if I could add a day or two on the front or back end of the Fresno trip. I got a preliminary OK, and after checking schedules, found it was easy to load two days to the front of the trip - I was travelling elsewhere right after Fresno. It was too good an opportunity NOT to take. I booked early flights (actually saved the company money) and started planning. As I planned and researched Yosemite was my front-runner. Hiking trails, waterfalls, rivers, vistas, and reading of John Muir's travels drew me in. The town of Oakhurst would serve as a great jumping off mid-point, being both an hour from the airport and Yosemite Valley. 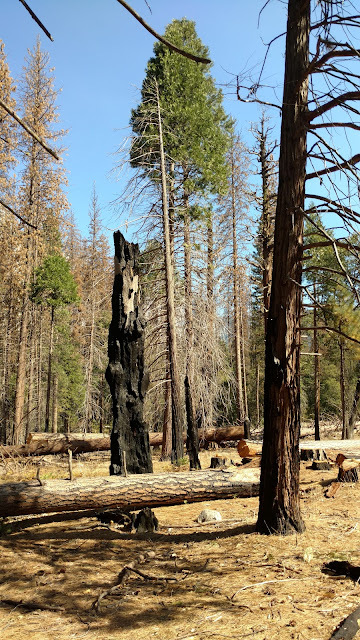 But recent wildfires had closed Route 41 - the main route - to everything I wanted to see in Yosemite. I decided to go for it. Glad I did! 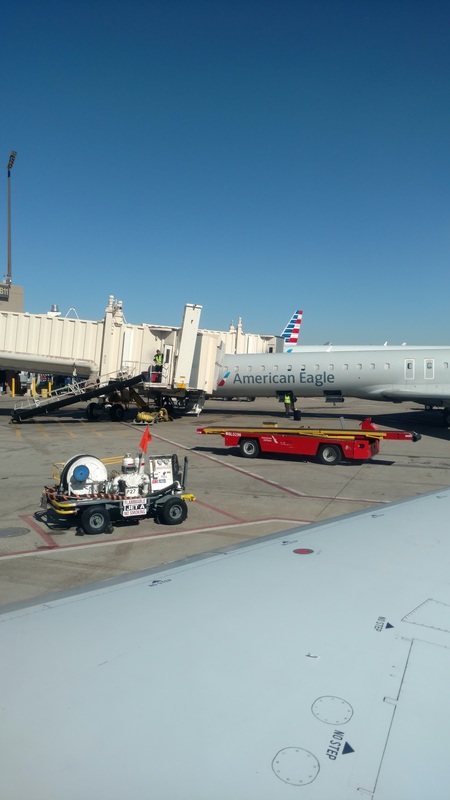 My air travel to Fresno had me switching planes in Phoenix. 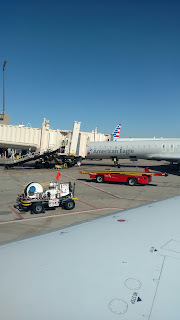 Not only did I need to switch gates, but terminals as well. In an airport I did not know. This was going to be fun! Thankfully they had some moving walkways between the terminals and I made it to my next flight with about 10 minutes till boarding call. Not bad, but I'm not one that enjoys calling it close. 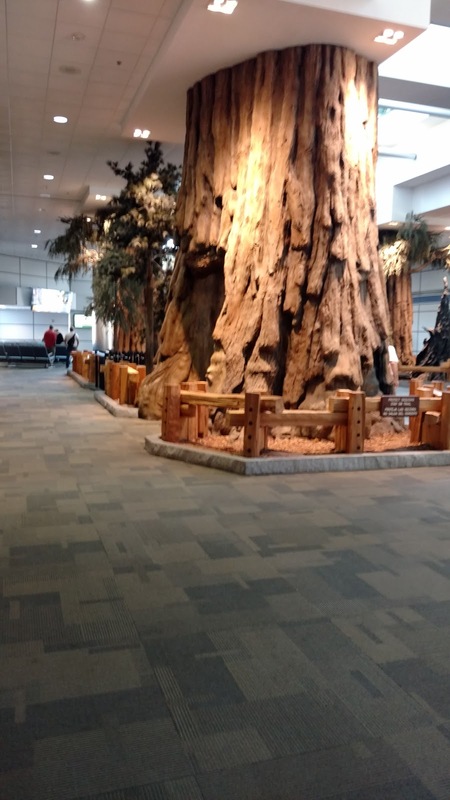 Fresno airport's official name is Fresno Yosemite International Airport. Not all that bustling, it has two runways and one terminal, with a pretty long walk to my "Emerald Aisle" rental car. 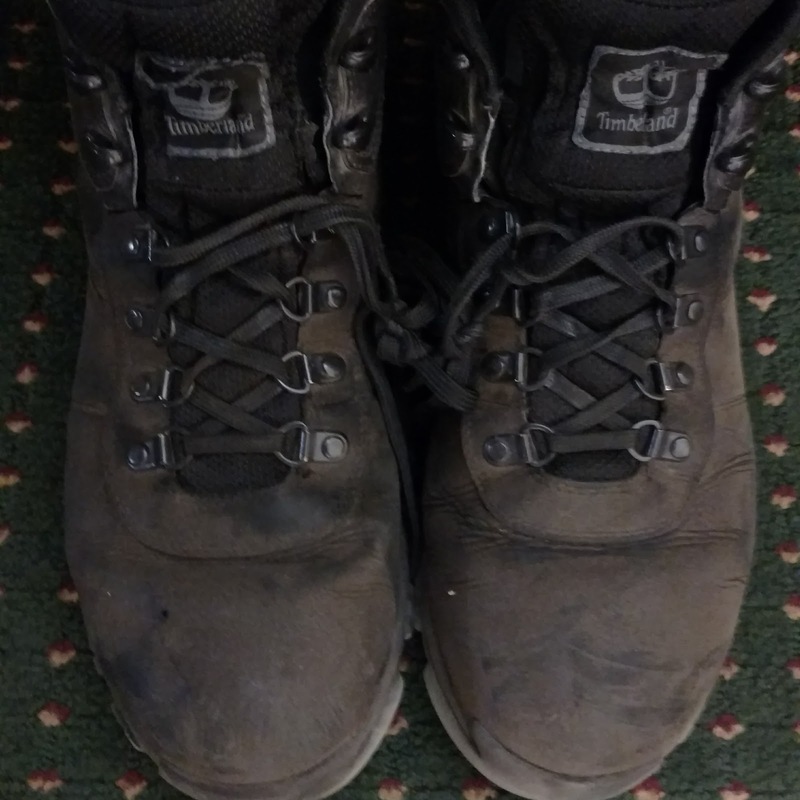 I wanted to do hiking, but not with ALL my equipment and bags! Choices were slim, but I chose a 4WD Jeep Compass - seemed appropriate for the Sierra Mountains. I threw in my bags, checked out the car and was on the road to Highway 41 and Oakhurst California. 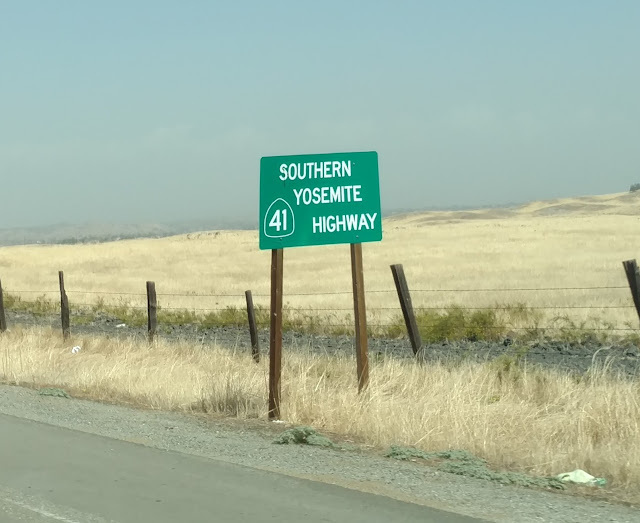 Highway 41 in Fresno area is a multi-lane monstrosity like any other major city, but as you get out of Fresno and into the foothills, it becomes only two lanes. As I drove, past plateaus, ranches, and scrub filled fields, I noticed it was pretty dry - and plenty of smoke in the distant mountains. On the way to Oakhurst there were some interesting little towns along the way. If I had been more rested after my six hours of flights, I may have stopped. Indian Springs and Coarsegold will need a stop some day. After getting to my hotel in Oakhurst, it was time to get something to eat and provision for the next day. I had previously mapped out some eating spots and decided to visit the South Gate Brewery. 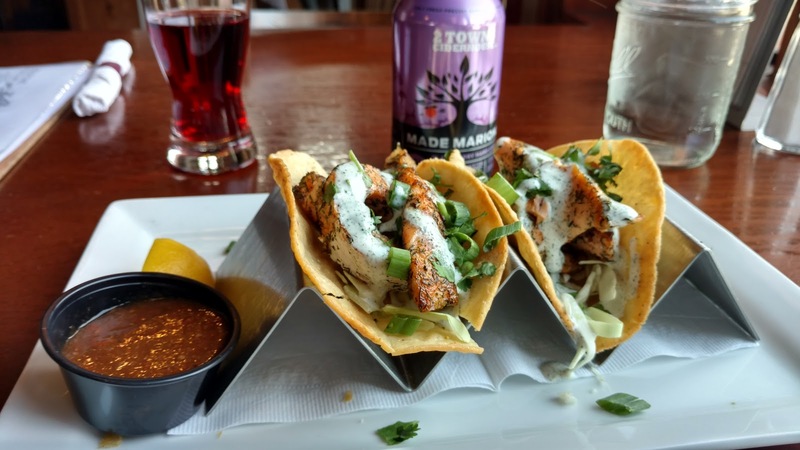 Enjoyed a delicious plate of Salmon tacos with thick hand cut chips, and two brews, a blackberry cider from Oregon, and South Gate's own wheat on tap - Honey Badger Wheat Ale. The wheat was definitely the better of the two! Salmon Tacos - hit the spot for a hungry traveller! Items I brought from home for hikes included small flashlight, floppy hat, sweater, extra weatherproof jacket, binoculars and backsack. I was pretty sure to see the most area possible that I would only be able to work in shorter hikes, so I found a great resource in Yosemite Hikes Website. Woke up before five am (not hard when your body is still on East Coast Time) showered, and grabbed by pre-packed gear. and headed out by 5:45, headed on Route 41 up into the Sierra National Forest. There were plenty of drivers headed up that knew the road better than I and rather then slow them down, I pulled over at a few overlooks to let them speed on past. As I climbed in elevation, it became more chilly, and as I was pulled over at an overlook, looked up. In the morning darkness there were more stars that I can usually see camping anywhere on the East Coast. Route 41 at this point was narrowing to two winding lanes, snaking up into the mountains - occasionally dipping into a valley and then climbing once again. When I got to the Park entrance, there was construction work going on, and no one manning the stone work booths to collect fees. As I neared my first goal, the first light let me see the drop-offs that were along the roadway. Maybe it WAS best I drove up in the dark! 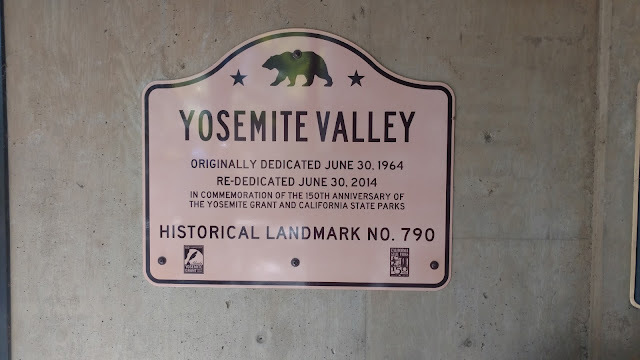 I finally saw and passed through the long tunnel I was expecting - and pulled into the parking lot of Tunnel View. Only a few photographers and other early risers were there catching the first morning light as it hit the tops of El Capitan and Half Dome. 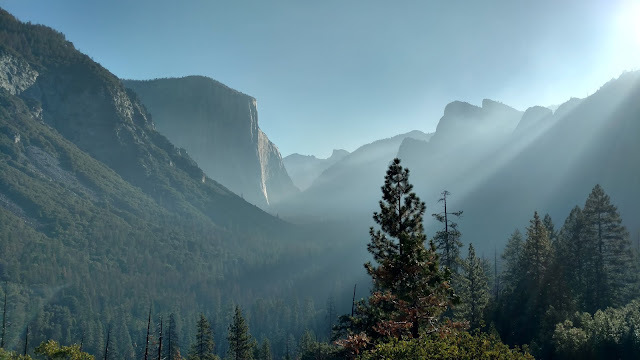 People were mostly silent as together we watched the sunlight pour into the Yosemite Valley. It was cold, and I was glad for my sweater and windbreaker. Some were dressed even warmer in down jackets, knit hats and gloves. My first trail started at this parking lot, so after admiring the view a bit longer I headed to climb partway on the Glacial Point Trail, to an offshoot of an old Stagecoach road to Artist's Trail. The trail was rocky, steep, and not marked with blazes on trees or rocks as I'm use to on my East Coast hikes. I actually missed a turn and went off the trail a bit - though it rewarded with some great views from right over top the tunnel road. Looking back where I just hiked - Yup I thought this was part of the trail. Back on the trail, it continued to climb via a series of switchbacks. There were great views and interesting plant life all along the way. After a particularly steep switchback, I rested on a natural rock seat and had a sip of water while taking in my surroundings. A bright blue bird caught my eye in a nearby bush. I later identified it as a Steller's Jay - common in Yosemite, but new to me! 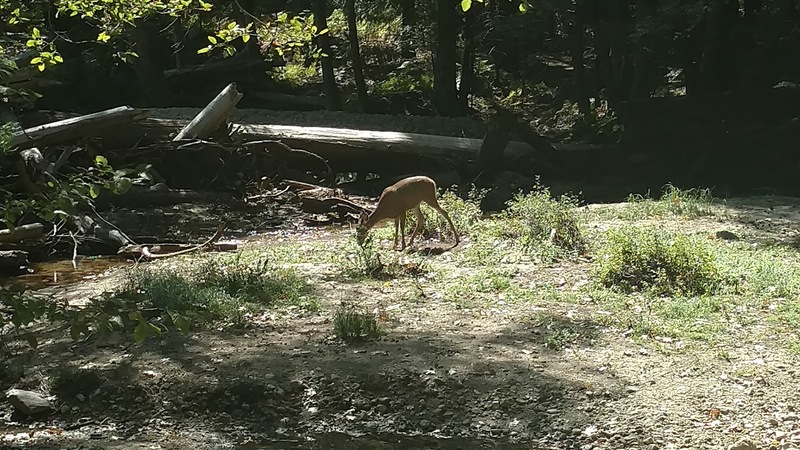 Then, as I stood to continue on the trail, I saw an animal dart onto the path ahead, stop - look my way, dart across the trail and down the mountain, Coyote? Weazel? Mink? Racoon? I was not at all sure, it had a longer bushy tail of black and white, and body coloration was in the blacks or grays. 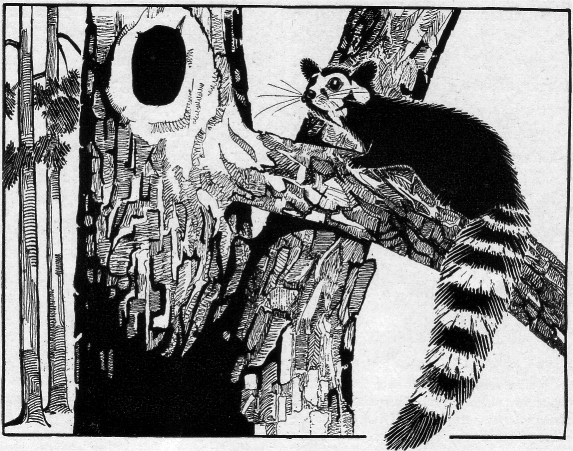 After some research, Turns out I had seen a Ringtail Cat! Only had a short glimpse of the guy, but heard him for quite a while heading downhill through the underbrush. 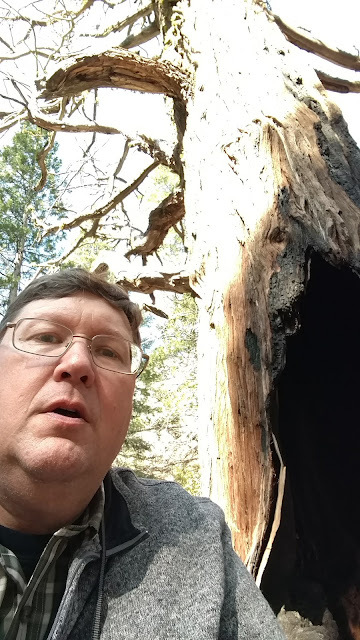 I climbed with the trail a bit further, but never got to, or crossed the old stage coach trail I expected. After hiking about 40 minutes, due to this being my first trail, and not having trail markers, I made the decision to turn back and head to the parking area at Tunnel View. Wish I continued, but as the day went on - not a regrettable decision. 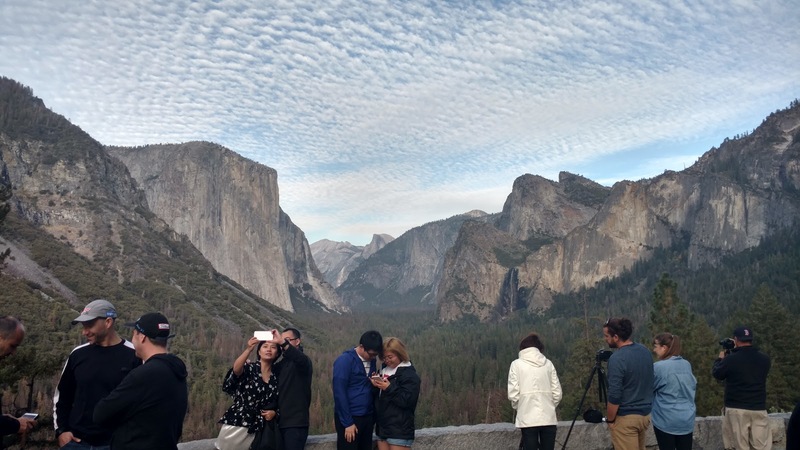 By now at Tunnel View, at the parking lot was fuller, as cars trucks and RVs jockeyed for spaces. I jumped in the jeep and headed for my next spot - Bridal View Falls. Bridal View Falls had plenty of parking, and the trail to the viewing area is fully paved. Since my visit was in autumn, the falls flow was not filled with spring snow melt, but it's height and surrounds were still impressive. 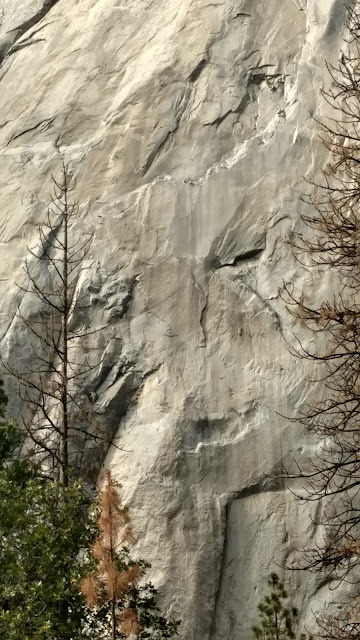 It was interesting watching the updraft move the ribbon of falling water across the face of the cliff. After a short stay, and assisting some German visitors with a photo, I headed back down the trail to continue taking in the Yosemite Valley. 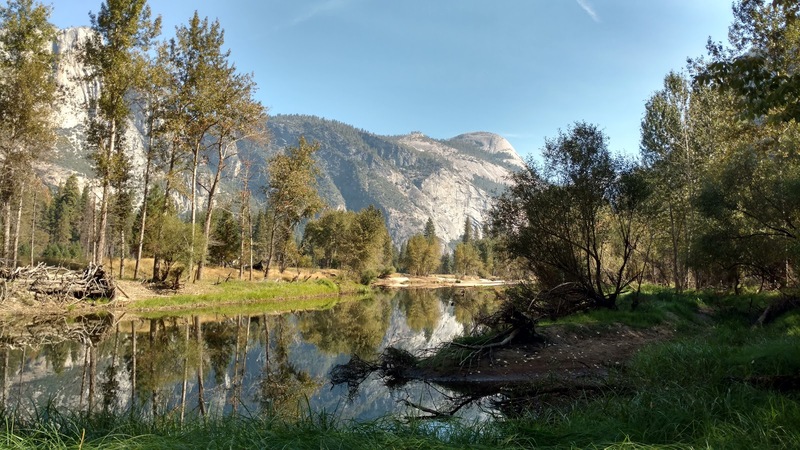 I wasn't sure where to head next, but the roadways in in the Yosemite Valley are set in such a way after Bridal Falls to take you (via Southside Drive) south along the Merced River, and then back north (via Northside Drive) toward Tunnel view via the opposite bank. 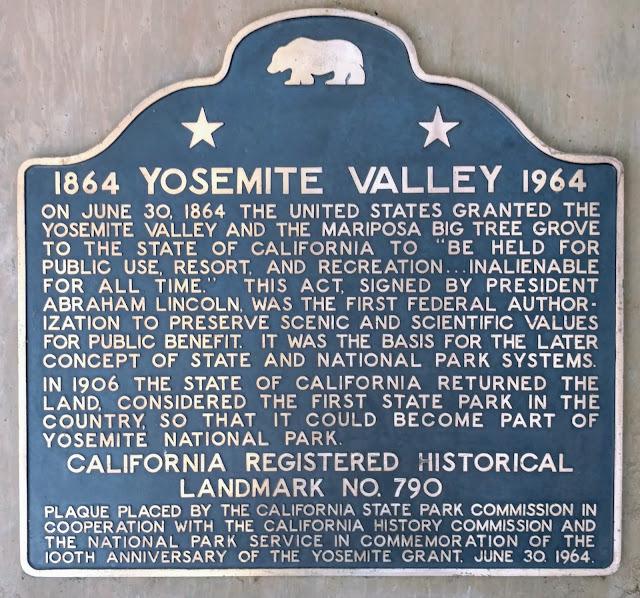 Once the road arrived to the valley floor, I emerged from forest and entered into an open meadow enviorment with street side parking to either side of the driving lanes. Once parked, the rising mountains to either side probably caused me to stare car-side longer than I'd like to admit. The suddenness of the vertical height encasing the valley was a new experience for me. 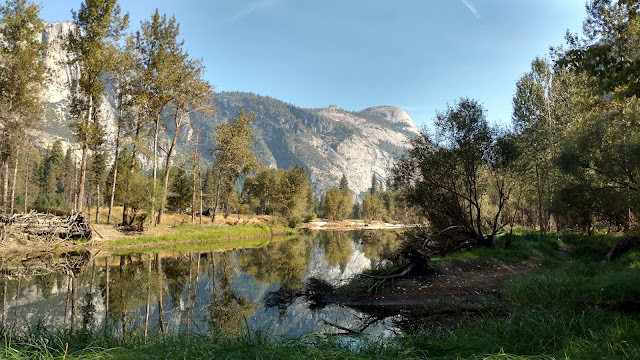 There were plenty of trails toward the Merced River, so I followed one and soon was able to climb down the rocky bank to be riverside. I just stayed here and enjoyed the views of river and rock formations for a good twenty minutes. Below is a 40 second clip of the views beside the river. I found two small granite rocks for mementos of my time there and placed them in my pocket. After exploring the meadow and creating a Photosphere of the meadow and surrounds, I jumped in the car again to explore further along Southside Road. Along the road, there are plenty of picnic areas or smaller pull-offs. 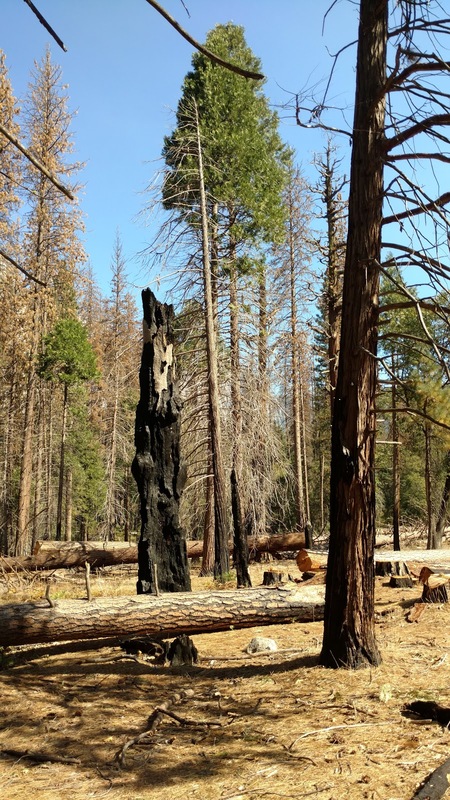 One area had recently had a forest fire, evident by scorched and fallen trees. I turned into the small two spot parking area next to massive trees laying on their side. These were cut down it seemed after the fire damage. 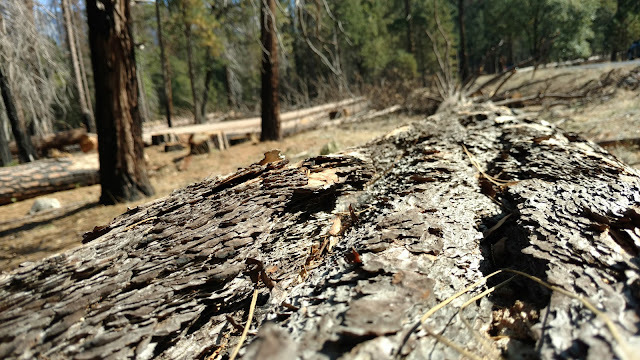 The fire must have happened a while ago, as the fallen pine needles were untouched on the ground, and there were even low, flowering plants blooming. 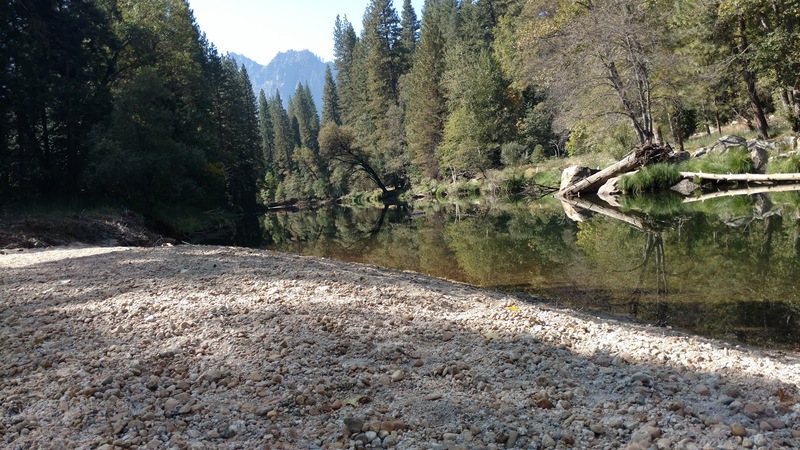 In this place the Merced River was much more calm, a slow flowing ripple of water. As I sit chowing down on a brie-on-ciabatta sandwich here in Watkins Glen, I realize how RVing has changed in the over decade now we have been blessed to have travelled in RoadAbode. We still all enjoy exploring places, but actual "downtime" seems to be more of a priority. 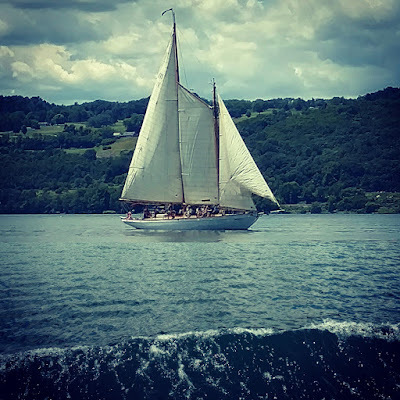 Reading, coloring (yes adult coloring books are a thing) or playing card games - and NOT being weighed by responsibility I've been discovering are just as much fun as developing "the plan" of how we are to spend every waking moment of our vacation. Just feeling blessed to spend time together as we all get older. That's not to say we still don't have to deal with work issues. We spend at least a few minutes a day answering questions, even signing in to resolve an issue or two. But only when needed, and not the constant worry of years past. So for this trip, I had an inkling of where and what to do, but left plenty of time to either discover some new things, or just some down time. We had plans that would work in case of rainy days, and sunny days. That was about the extent of planning. The Gorge is beautiful. 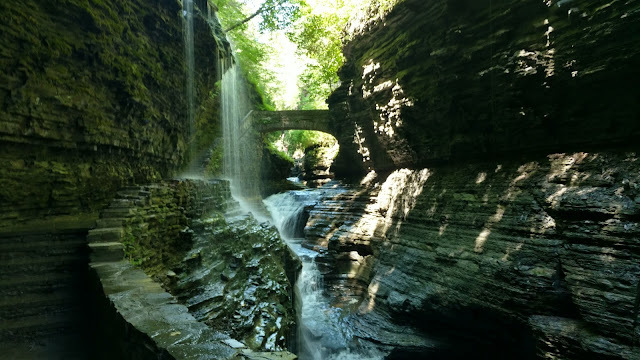 Even though the entrance in under a reconstruction, it's still a great hike. 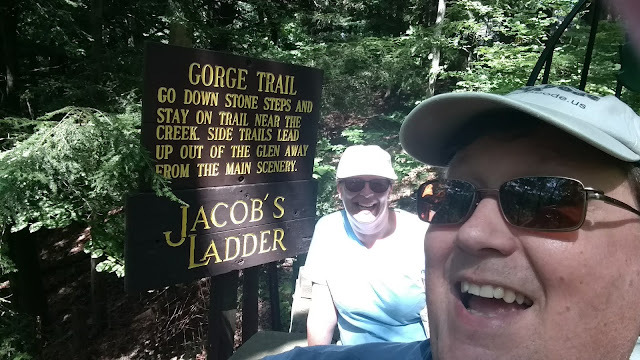 We like to find some free street parking down on tenth street, (near the Police station) then walk up to just outside the gift shop and catch the shuttle to the top entrance of the gorge. The shuttle is $5 each, but worth it to do the walk only one way - downhill. Just remember to turn around to see some of the incredible swirling waters in the gorge. 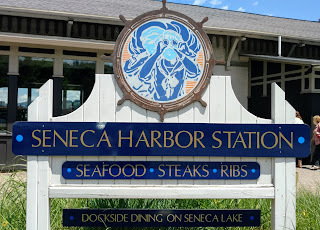 In the Village of Watkins Glen check out the eateries and shops. I was able to pickup a lightweight raincoat at a keen price. Take a stroll all the way to Seneca Harbor Station - and enjoy a dinner view of the lake - or better yet - ON the lake with a dinner cruise.